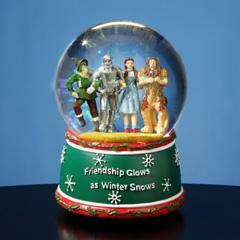 "Friendship Glows as Winter Snows"
Wow! This musical figurine is so amazing and would be a wonderful addition to any collection. Dorothy and her friends are gathered around a fire that actually lights up! Perfect detail. Tune: "We're Off To See The Wizard"
Light Requires 2 x AA batteries. New - Dorothy is caught in the middle with Nikko and the "Wicked Witch". This perfectly detailed globe illuminates and plays: "Witch Song" , "I'll Get You My Pretty"
and features amazing touch/sound activation. Requires 3xAA batteries, not included. This is an unique, AMAZING musical figurine from Wizard of Oz that actually rotates! What a special piece this would be to add to any collection! the "witch" is on her bicycle. Tune:" It Really Was No Miracle"
TM/MC & © Turner Entertainment Co. The tornado revolves inside with blower and rotation as Dorothy and Toto hold on. 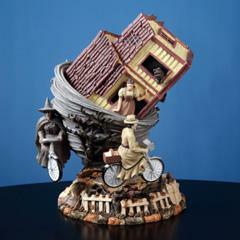 Dorothy and Toto are on the base that is surrounded with broken fence while the tornado lifts up the house on the inside of the globe in wonderful detail. 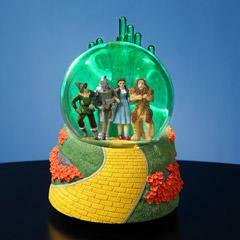 Tune: "It Really Was No Miracle"
This beautiful emerald green musical water globe from Wizard of Oz actually lights up as the four characters from Oz make their journey. 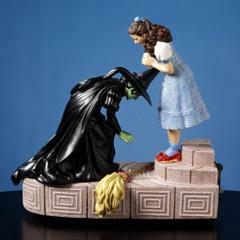 This unique, beautifully detailed Wizard of Oz figurine celebrates The Wizard of Oz 75th anniversary with a limited edition of the famous Ruby red slippers on Dorothy with the "Wicked Witch". Features Touch/Sound activated "Ruby Slippers" that actually light up!